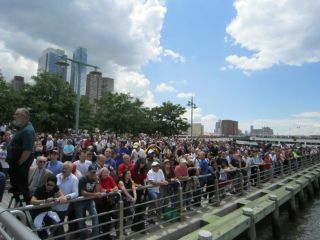 NEW YORK — Hundreds of eager spectators lined Manhattan's West Side Pier 84 today (June 6), as the space shuttle Enterprise completed the final leg of its journey to the Intrepid Sea, Air and Space Museum. Enterprise arrived at the Intrepid museum at around 12:55 p.m. EDT (1655 GMT), after floating up the Hudson River on a massive barge. Along the way, the shuttle cruised past several iconic city landmarks, including the Statue of Liberty and the World Trade Center. As Enterprise approached the Intrepid — a retired World War II-era aircraft carrier that has since been converted into a museum — excited onlookers clapped, cheered and snapped pictures of the historic vehicle. Linton watched Enterprise's trip up the Hudson River from Pier 84 with his father, Clinton, who said it was important for him and his son to witness the shuttle's arrival in person because it marks an important chapter in the city's history. "I'm a native New Yorker, and I try to teach my sons everything about New York," Clinton told SPACE.com. "I think this is one part of history that is always going to be talked about, and I want to give my kids that full experience." Clinton added that he was especially motivated to see Enterprise today because he regretted not witnessing the shuttle during its flyover of the city more than a month ago. On April 27, Enterprise flew piggyback atop a modified 747 jumbo jet from its former home at the Smithsonian's National Air and Space Museum's Steven F. Udvar-Hazy Center in Chantilly, Va. to New York's John F. Kennedy (JFK) International Airport. En route, the shuttle and its carrier aircraft flew past some of the metropolitan city's most recognizable landmarks, including the Statue of Liberty and the Intrepid museum. "There are too many 'would've, could've, should've' moments that got by me, so I don't intend to pass up many other opportunities," Clinton said. The shuttle Enterprise never flew in space, but was used by NASA for a series of approach and landing tests in the 1970s. The prototype orbiter was previously on display at the Smithsonian's Steven F. Udvar-Hazy Center, but was awarded to the Intrepid museum in 2011. The Smithsonian was given the space shuttle Discovery, the oldest and most space-flown shuttle in NASA's fleet, in exchange. While New York may not seem like the "spaciest" city to host a space shuttle prototype, that perception is part of the reason why Enterprise will be such an important exhibit here in the city, said Susan Marenoff-Zausner, president of the Intrepid Sea, Air and Space Museum. "I think that's one of the most significant reasons why we wanted to bring the space shuttle to New York," Marenoff-Zausner told SPACE.com. "This is now NASA's largest and probably most important artifact in the entire Northeast region, so this region has never had that representation before, and we're so humbled by it. What it shows us is that we have a responsibility, and that responsibility is to perpetuate our history, but also use this as a platform for furthering education in the sciences." "Seeing the crowds lining up on both the New Jersey and New York sides was just incredibly emotional," she said. "We've just had unbelievable public support since the day it flew into New York. I've never seen so many boats on the Hudson River at one time. It really created this New York moment of everybody coming together for a really good thing. It has just been tremendous." After the barge carrying Enterprise arrived at the Intrepid, workers attached a giant crane to the shuttle and hoisted the 150,000-pound (68,000-kilogram) vehicle onto the museum's flight deck. This process lasted several hours, and while the crowds died down a little bit, many people opted to stick around to witness the unique moment. "It's very impressive," NASA's deputy administrator Lori Garver said about the enthusiasm of the spectators. "It's a great thing to see members of the public see what we in the space program know is such an important part of our history and will lead to an even brighter future." As Enterprise pulled up to the Intrepid under sunny skies, Garver commented on her own enthusiasm for the moment. "This is one of the better days at NASA and I don't think I would ever get tired of it if they made me do this every single day," she said.